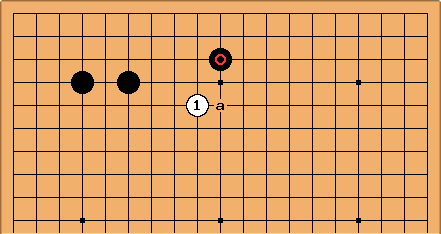 is a knight's move cap against . Compared to the ordinary cap at a this is more forceful. That doesn't imply that it is better; but this is one of the standard ideas of reduction play. in reply is good for security; but in some contexts it will be a little too submissive. Simply ignoring White's play invites , which is quite severe. 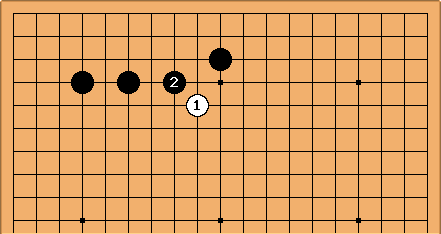 One advantage the knight's move cap has is that this follow-up is stronger than in the case of the cap. Black should consider fighting harder with the contact play and cross-cut . Now there will be a tough fight, and ladder relationships can be important. Therefore is an option: this warikomi play makes it quite hard for Black to decide between a and b next. 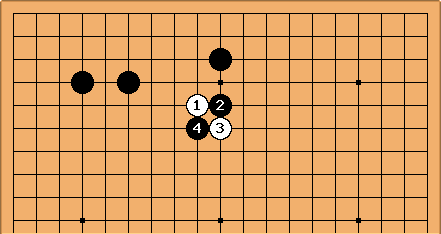 There is a good example of this tactic in game 8 of the Kamakura jubango.